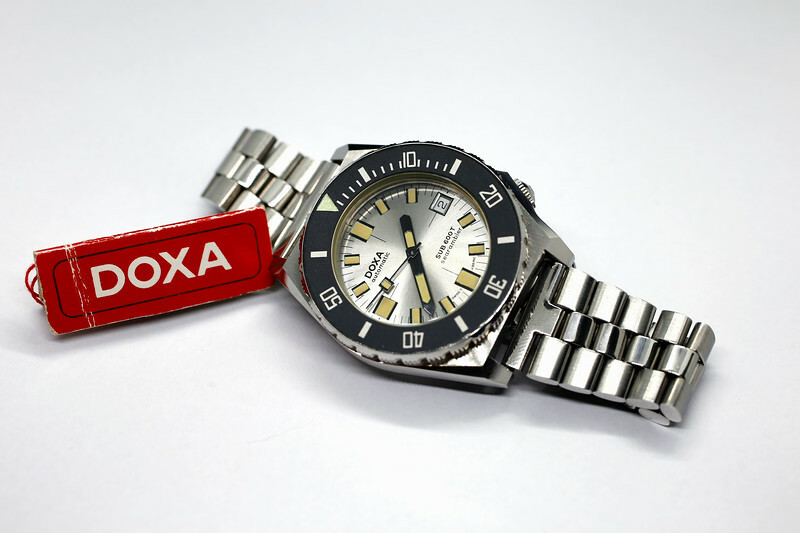 The Doxa company over the years went through many acquisitions and changed ownership but in 1978 DOXA was acquired by the Aubry Freres Company, and during the early 1980’s they produced some radically different designs in addition to the classic tonneau divers. Most vintage Doxas are pretty rare, but the later ones which also have the higher depth ratings are especially hard to find like the Doxa 600T Searambler.  Case: three body, stainless steel, 39 mm, rotating black bezel, screw down back and offset crown, sapphire crystal.  Includes original Doxa hang-tag!! This specific DOXA Sub 600T is in NOS-like condition. The watch has been only worn for photos. Bracelet shows zero wear. The bold black hands remain in perfect condition showing zero patina and the tritium lume on the dial and hands remains perfectly intact without any lume loss or degradation. This is a truly stunning piece that would make a great addition to a vintage dive watch collection whilst prices are still relatively affordable. Rarity & condition will ensure continual price appreciation. Price is US$2990 shipped worldwide. Photos of the actual item for sale and correctly reflect the condition of the vintage watch for sale – please inspect the pictures closely while disregarding the dust specks/prints on the watch – these pictures are highly detailed and are part of the watch/auction description. I do not guarantee any water-proofing given the age and vintage nature of the watch; no box & papers are included with the watch, but I guarantee this watch is authentic. International buyers: Import duties, taxes and charges are not included in the item price or shipping charges - all of these are the buyer’s responsibility, even if the watch is returned for any reason! Thus, please check with your country’s customs office to determine what these additional costs will be prior to bidding/buying.